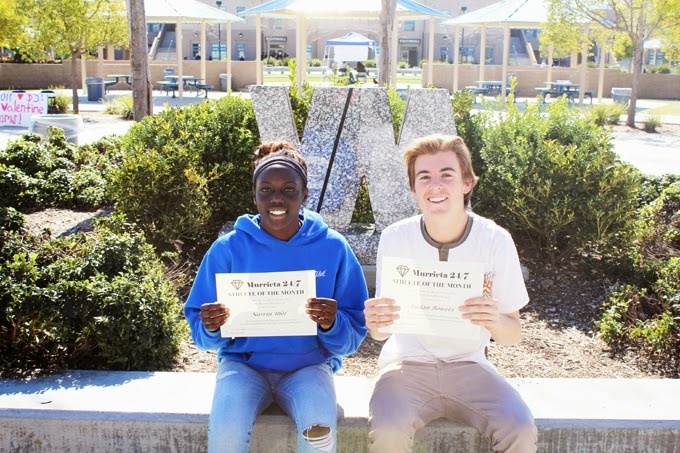 Basketball standout Nasrin Ulel and soccer star Aydan Bowers have been selected as the Murrieta 24/7 Athletes of the Month for January representing Vista Murrieta High School. Ulel, a junior shooting guard, is averaging 10.4 points per game for the Broncos, who went into today's game against Chaparral with an 8-0 league record (19-6 overall). She far exceeded that output in last Friday's game against Murrieta Mesa, however, scoring a school-record 46 points in a 91-51 victory over the Rams. "They were all hustle plays," said Ulel. "I was just running the floor. I had three 3s but most of the points were on rebounds, hustling and fast breaks. I didn't know how many points I had until somebody told me I was four points away from the record." Coming back from an ACL injury this season, Ulel has established herself as a key player for Vista, which is preparing for the CIF playoffs next week. "We fell off a little bit, but we've been playing very well lately," she said. "We came together and we're more unified. Coach is always telling us that one of our biggest problems is maturity. We're really young and we need to stay consistent." Ulel is already receiving inquiries from college recruiters. She plans to become a surgeon. Bowers, a senior center midfielder, holds the school record for goals in a season with 18 entering today's game against Chaparral. The previous record was 12. "I'm taking more chances this year, taking shots I usually don't take," Bowers said. "If I see a shot, I'm taking it." Bowers is captain of a team many expected wouldn't be where it is today. The Broncos are 6-0-2 in league play and 15-4-4 overall. "We weren't supposed to be as good as we are, and I think that motivated us to be where we are today," Bowers said. People thought we weren't going to make the playoffs. We proved them wrong." The Broncos will learn the identity of their first-round playoff opponent when the match-ups are announced on Monday. Bowers plays club soccer when the high school season is over. He is receiving some scholarship offers from Division II schools.